This is the BEST pepper steak recipe, a winner in my home with my family! 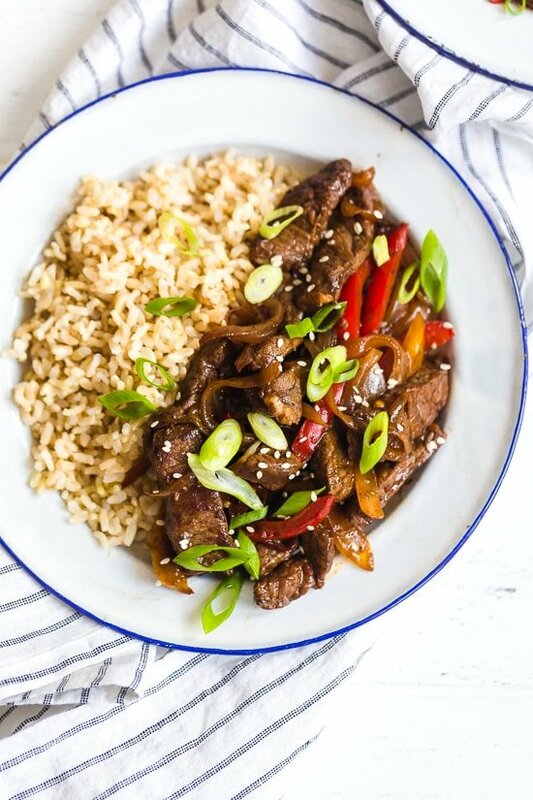 Pepper steak is quick, easy and perfect to whip up any night of the week. 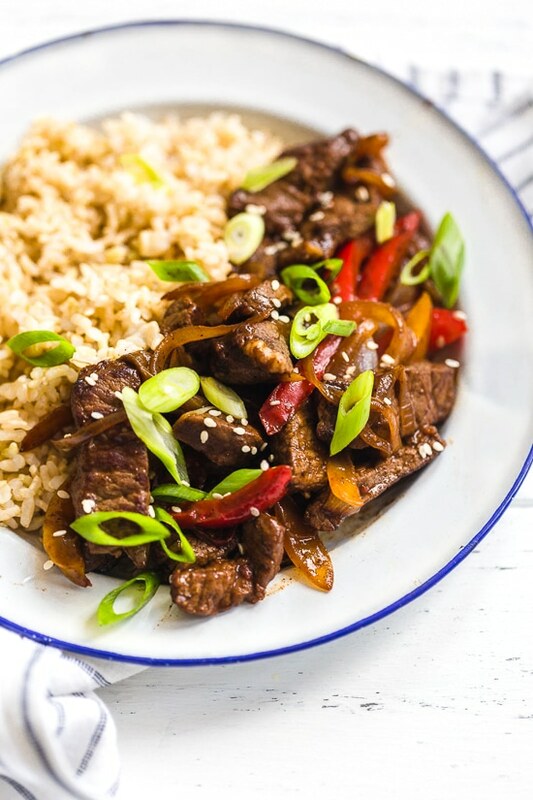 Strips of beef and bell peppers are stir fried in a wok to create a delicious main dish, ready in no time! I love it with brown rice, but cauliflower rice would also be great on the side. 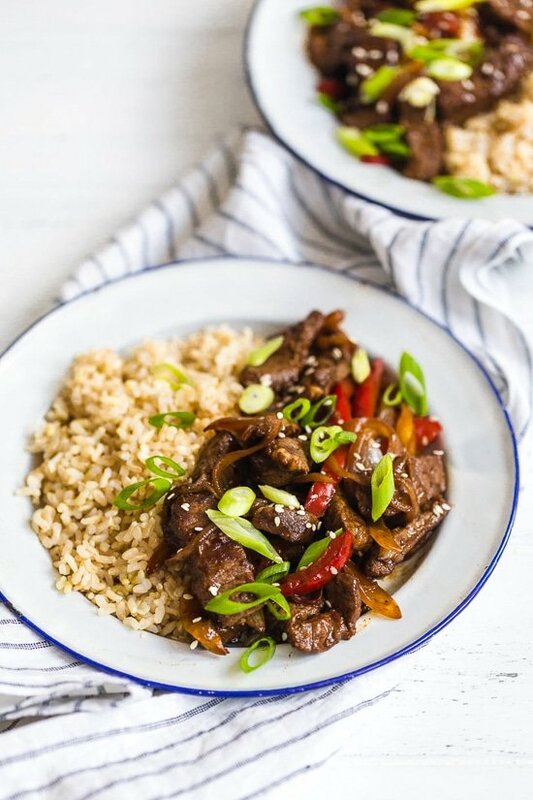 As a kid I loved when my Mom made pepper steak and it’s always a hit in my house today. This can easily be made gluten-free, whole30 or Paleo. The key when stir frying any meal is to have all your ingredients chopped and prepped before you start to cook. Once prepped, your meal will be ready in minutes. Slice beef into thin slices with the grain. Cut each strip across the grain about 1″ long so you have small thin slices. Place in a bowl and add 4 tsp of soy sauce, 1 tbsp of rice wine, 1 tsp cornstarch and black pepper. In a small bowl, mix 3 tbsp soy sauce, 1 tbsp water and 2 tsp cornstarch. Set aside. Heat the wok on high heat. Swirl in 2 teaspoons of the oil and add the beef spreading evenly in the wok. Cook undisturbed for 20 seconds letting the beef brown. Using a spatula, stir meat, cooking another 2 minutes. Transfer to a plate. Add remaining teaspoon of oil to wok, add peppers and onions and cook about 4 to 5 minutes. Return beef to the wok, add the sauce and red pepper flakes and stir fry about 30 seconds until slightly thickened. Made this today havwnt tried it yey but i guarantee it going be delicious. Just made this and it was great. I used the amino acids which may have added to the saltiness. I will definitely try it again but with low sodium gluten free soy sauce. Made this tonight (with a few changes), and it was delicious, easy, and quick! Thank you!!! This was delicious. My family loves it! Will definitely make this again. I couldn’t find rice wine in the store so I used white cooking wine I had on hand. Yummy! Thank you Gina ???? Could you do this in a pressure cooker? My picky husband took one bite of this and vowed he’ll never buy restaurant pepper steak again. I used low sodium soy sauce, and the recipe still had plenty of seasoning. I also doubled the sauce to pour over brown rice. Quick and easy, with great results! Made this with steak and it was delicous!!! Wondering if it would be good with chicken?? Would I need to change any of the recipe? I cook this recipe easily once a week, and my other half says its one of his favourite meals! It’s so quick and easy to whip up. I use rice vinegar, as haven’t been able to find rice wine but still tastes delicious! I made this last night. It was pretty mediocre. Make sure you get a good cut of meat or it will betough and it matters. Definitely needed more flavor even with the added red pepper flakes. Any idea what the point value (WW Freestyle) without the rice? Delicious!! I will definitely make this again and again! My family loved it! 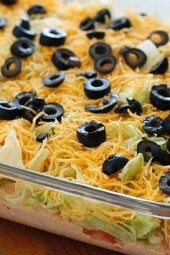 I am on weight watchers and have been making this for the past few weeks for my family. We all love it. It is delicious. Hello I do have a question after you cook the meat do u drain the juice or keep it in the wok and cook the vegetables in there with it ? Really Good! I have travel to okinawa, japan wear it is a melting pot of food from different countries. There is one amazing place that serves the best Pepper Steak called White Kichen (not misspelled). This comes in at second on my list of great tasting asian cuisine! Thank you! So quick, so easy, so delicious! Will be making this again. Thanks Gina! As a freezer meal would you make recipe then freeze or prep everything freeze raw??? Can this be made with chicken instead of steak? Would there be any adjustments needed? Really good recipe. I used flat iron steak and the red wine vinegar I had on hand from the chickpea and tuna salad. Also added ginger and garlic. Thanks! Doesn’t the smart points include the rice or just the beef and sauce ? Just the beef and sauce. Excellent, I substituted red wine vinegar it was still awesome! Made in a cast iron skillet with rice vinegar instead of rice wine. Love this recipe, and my bf will actually eat his vegetables! Is it possible to convert this to instant pot? Is it rice wine as in Sake or rice wine vinegar? Always a winner! My kids and hubby love it! Even the toddler will eat it when I stick blend it. (He has a texture aversion to any meat except “hotdog”. Argh! )Lol we call It pepper soup and he devours it. Thankfully it allows us to get him to eat more veggies and meat! LolWe have been making this one for years! Thanks, Gina! I made this tonight. It was super fast and quite tasty. We will definitely have this again. How could this be prepared in a slow cooker? I made this for dinner tonight and it’s was a hit. I used skirt steak since I picked up a piece that was marked down. It was probably higher in calories because of that but the steak was nice and tender. I also used low-sodium soy sauce. I absolutely love this recipe and somehow, miraculously, my kids love it so much that they forget to complain about the peppers and onion. We serve it over rice and it’s just delicious. I always use rice wine vinegar since I read the recipe that way the first time and have forgotten every time since that it’s not vinegrar. But it’s so good that I can’t even imagine that we want to try it with rice wine at this point. Also have made it with Petite Sirloin, Flank Steak and Top Round and doesnt seem to matter which one as it tastes great every time. We made this as written except we used rice wine vinegar instead of the mirin. And, we Loved it! So much flavor. We had it with white basmati rice. We plan to have it often. Thank you! So easy & so so good! I made in skillet instead of wok. Great flavor & quick to prepare. I dont know what I’d do without Gina & Skinnytaste! Thanks for another awesome recipe! This was very good. Even my most picky eater loved it. Thank you so much for posting. I️ used 1 lb sirloin steak and an extra pepper. Also sub’d sherry for rice wine. Excellent. A definite repeat. Gina,Made this last night, served it with brown rice and edamame as an appetizer. It was super easy, and everyone loved it! Husband said if we are going to be eating more low cal meals this year, this one must me added to the rotation. Thank you for your awesome website!! Hi, what’s a substitute meat I can use? We don’t eat beef. Hi. Can you tell me how you got the calories count. I input the recipe into MyFitnessPal and got around 296!!! This is absolutely amazing with sesame oil instead of vegetable oil. I made a version of this tonight and it was with sliced flank steak, and I put it all in the crock pot for a few hours. So good. If I wanted to put it in the freezer, should I do it before cooking? Thanks in advance. I entered this recipe on my Weight Watchers app but the app gives it 4 Smart Points, while your site says 6. Which is it? I have a cast iron wok, however I opted for using my large cast iron pan. I added about 1 teaspoon of red pepper flakes to the meat when it was mixed with the sauce and I set it in the fridge for a few minutes. I added steamed broccoli and served over traditional sushi rice, really enjoyed this recipe. I used Pinot Grigio in place of rice wine and also added some minced garlic and fresh grated ginger. Turned out delicious. Definitely adding this to my rotation! Can I use flank steak for this instead? Did not need the oil or boulion cube. One cup of water and soy sauce worked well. So good!!! I used flank steak BC that’s what I had in the freezer, and threw in some fresh grated ginger and garlic with the peppers BC why not? Was so easy, I always have these ingredients on hand, and took 15 mins tops. I was waiting for the rice! Will definitely be adding this to the weekly rotation. Can this be done in the Instant Pot? I just made this tonight. Oh my it was amazing. So simple yet so flavorful. Husband ask “you’ll be making this again right?” I served over some noodles and a side salad and it was the perfect dinner! Made this tonight for the family, everyone loved it thank you! Made this dish this evening with gluten free soy sauce and rice vinegar ~it was delicious! My kids and husband devoured it! Thanks, Gina! Best stir fry I have ever made at home. Better than take out. I threw in some snow peas I am on Weight Watchers and I am so excited to have discovered this site. Made your taco stuffed zucchini for dinner the other night and it was delicious. Thanks for putting the smart points on each recipe. Looking forward to trying many more recipes. This was awesome! Everyone cleaned their plates! So good! Love the idea of adding broccoli or snow peas. Will definitely be making again! Made this tonight! Definitely one of my new favorites!!! This was delicious! Definitely a new recipe in our rotation!!! i tried this tonight. Soy sauce can through a little too strong for me, but my husband gave it high marks. I didn’t notice that the recipe was calling for rice wine and not rice vinegar until I was quite far along. Next time I will try sweetening the rice vinegar with a little sugar if I still don’t have rice wine on hand. The sweetening may also help cut through the saltiness of the soy sauce. Definitely on the list to try again. For those wondering, I made this last night with a sirloin steak and it came out fantastic. I got a thumbs up from the whole family to make this again. It was quick and easy. I made it exactly as suggested, but you can easily adapt to your family’s vegetable preferences. I will add broccoli next time, as my family loves it in stir fry. Thanks Gina for another great recipe. I have been coming to your site for years and I’ve never been disappointed. What is a whole30 sub for rice wine? I love this recipe. I used balsamic vinegar and it was AMAZING! My fiance said it was the best pepper steak he has ever eaten. That’s good to know, thanks for the tip. I don’t want to buy another ingredient if I don’t have to and we always have balsamic vinegar on hand. Thanks! Omg made this tonight using thin trimmed New York steak. It was really really good! We are making this right now! You have it tagged as freezer friendly. What are the freezer directions? 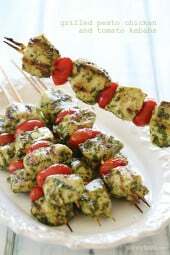 Freeze after cooked, to reheat that overnight in the fridge and heat as you would any leftovers. This looks so good! It should be coconut aminos for whole30 though, not liquid aminos, which is still made of soy. Yes, you can use a frying pan if you don’t have a wok. I’ve made something similar but used flank steak and added tomatoes also. The green onions and sesame seeds in the finished dish are just to make it look delish! Can you use a frying pan instead of a Wok? Or should I invest in a Wok? Looking forward to trying this recipe, but for the life of me I can’t find rice wine. Did you mean rice vinegar, or is rice wine an actual bottle of wine? Thanks! I can’t find rice wine- what is a good sub? I always sub in Sherry instead of Rice Wine for her recipes 🙂 They always turn out delicious!! Yes, I have made it with Petite Serloin Steaks and it was great! Hi! This looks great and easy, I’m going to make it tonight. It looks like in the picture that it’s garnished with sliced green onion, but it’s not mentioned in the recipe. I know this is me being picky, but it’s an ingredient in the photo and not listed in the recipe, or am I missing something? Is the rice wine the same as rice wine vinegar? I have that in my cupboard. You can sub rice wine w/rice vinegar or dry white wine. My entire family loves everyone of your recipes. We are patiently awaiting book number 3! 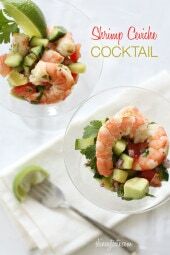 Will be making this yummy looking dish next week. Thank you for all of the work you put behind each and every recipe. Can I use a frying pan if I do not have a wok?